This type of bottle rinsing equipment uses air to clean and remove dust and other debris from glass, plastic, metal and other containers. By spraying the interior of the container, a vacuum is created to remove contaminates. 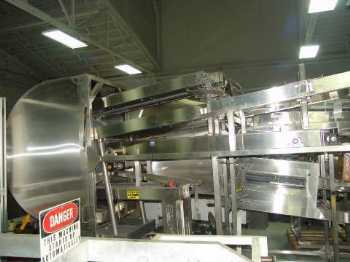 Removing contaminates helps ensure product quality and security. Air bottle cleaners can be designed to use either normal compressed air or deionized air. Used Elf Machinery 6 Head Bottle Cleaner.